The unresolved row between the Danish FA and their players over image rights looks set to have an effect on the Republic of Ireland's UEFA Nations League prospects after a number of internationals returned to their clubs today. The DBU have sent an uncapped team composed of futsal and domestic third/fourth-division players to Slovakia for tonight's friendly in Trnava. Hopes that the situation could be resolved in time for Denmark's home Nations League clash with Wales on Sunday are now in doubt, which would hand Ryan Giggs' team a huge competitive advantage in the three-team group that also features Ireland. Not fulfilling the fixture could result in a four-year ban from UEFA competitions. "Most of us, if not all, have returned home to our clubs," full-back Nicolai Boilesen told TV2 Sport today. "We can not sit and twiddle our thumbs anymore. It has been strange." "We have been ready all the time. We'd rather play and we cannot do more. If they do not want to take the phone and negotiate, it will be difficult. There's got to be two to tango." The dispute centres on how the DBU can use the players in sponsorships that might conflict with individual deals, for example, asking Nike athlete Christian Eriksson to appear alone in advertisements for national team shirt-manafacturer Hummel rather than as part of a group. 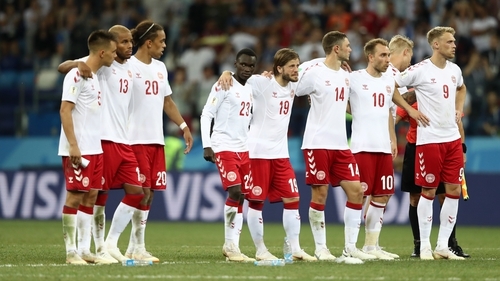 The Danish squad offered to play this week's games under a previous agreement and conclude negotiations later in the month but that was turned down by the FA, who seem determined to play hardball. "An offer has been made, which I hope the players will consider carefully and thoroughly. If the players cannot accept the offer, then we'll have a serious situation again on Sunday, because the offer will not be different," said DBU president Jesper Møller. TV2 journalist Jacob Qvirin thinks the standoff could go either way. "The Danish FA has said that they’re not going to continue negotiations until next week," he told RTÉ Sport. "I think they wanted to send a statement. This far and no longer. "At the same time, they say that they hope it’s only going to be one game. "I think their hope is that the players come back and say ‘we want to play that match against Wales because that’s a game that matters’. "Right now, it looks like it’s going to be this ‘B team’, but let’s see. I don’t think anybody expected it could go this far and there are a lot of ways it could end." Qvirin believes that the Danish public are split on the matter, which some see as personal posturing as much as an issue of principles. "The director of the Danish FA, Claus Bretton-Meyer, and the main negotiator for the Spillerforeningen (the players’ union), Mads Oland are two big figures in this. "Some people think this is not the Danish FA against the players, this is Mads Oland against Claus Bretton-Meyer. It’s like a political fight between them instead." "There’s a little more sympathy with the players' union but most people just want them to find a solution. "There are people saying ‘Come on, these players are our stars. Just give them what they want, they represent our national team, they need this'. As for tonight's friendly, which the frustrated Slovak FA is now charging just €1 admission for, Denmark is bracing itself for a record defeat - though unusually large viewing figures are expected given the novelty value of the selection. The 'B' team will be managed by Euro 1992 hero John Jensen as the DBU presumably didn't want Åge Hareide's relationship with the players to suffer. "The biggest defeat so far for a Danish national team is 8-0 to Germany in 1937," says Qvirin. "People expect that is going to be beaten tonight. "For the Danish viewers, this is more funny. It’s like David against Goliath in some way."